Drift management must include equipment management. Prior to the application season, inspect the application equipment and repair defective parts. Check to see that booms are straight, braces and springs are intact, shields are in place, hoses are in good shape and not rubbing over metal edges, fittings are not cracked, and clamps are tight. Recheck equipment at frequent intervals. Pay particular attention to the nozzles. Check each nozzle for uniformity of output and pattern. A partially plugged nozzle may not only affect the equipment’s calibration, but may produce more driftable fine droplets than a properly operating nozzle. The higher the nozzle is above the crop or target, the more opportunity the wind or air flow has to move droplets from the intended site. Spray equipment operated at high speeds can create turbulence in the airflow around the machine that can catch small droplets and make them vulnerable to drift. 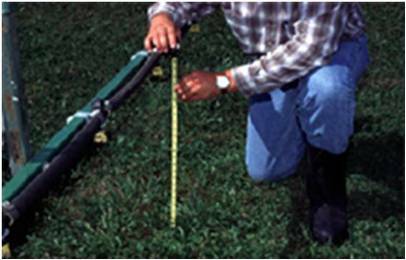 Determine the optimum height for the particular nozzle from the nozzle literature to reduce drift potential. If the nozzles are too low, uneven patterns or skips may occur. To prevent the boom ends from striking the ground, nozzle heights are frequently much higher than optimum on large application equipment traveling at higher speeds. In some situations such as aerial and airblast orchard applications, swath displacement can be an effective tool to reduce pesticide leaving the application site. An example of using swath displacement would be to skip the outer rows of trees and allow the spray to move through the last sprayed row to treat the outer rows. Having reliable knowledge of how far the spray will move under varying conditions is crucial. Also, determine equipment limitations when selecting nozzles. The recommended pressure or flow rate for a particular nozzle may exceed the capacity of the equipment. Consult the nozzle manufacturer to determine specific requirements and expected spray quality for each nozzle being considered. Below is a listing of manufacturers of many of the spraying nozzles and drift reducing equipment sold in the USA. The extended-range flat-fan nozzle has been the standard for boom pesticide application. Variations of this design are available from several manufacturers. The design is available in a wide range of flow rates and fan angles to fit many application needs. A nozzle with an 80° discharge angle produces a larger spray droplet than a 110° angle nozzle at the same flow rate and pressure. Spray quality is directly dependent upon the nozzle orifice size and boom pressure. Larger orifices and lower pressures produce coarser droplets that reduce drift potential, while higher pressures, above 30 psi, produce finer droplets that may be more susceptible to drift. These nozzles produce a uniform spray pattern when patterns are overlapped 30 to 50% and when operated at 15 to 60 psi. A pre-orifice nozzle reduces the internal operating pressure in the nozzle, producing a larger spray droplet than a standard flat-fan nozzle at the same operating pressure. The pre-orifice design contains a metering orifice (pre-orifice) that restricts the amount of liquid entering the nozzle. This is what drops the pressure within the nozzle. Pre-orifice nozzles are available in 80° and 110° discharge angles with a general pressure range from 30 to 90 psi. Pressure should not drop below 30 psi, due to the internal pressure drop in the nozzle. Pre-orifice nozzles can reduce drift by 50% over extended-range flat-fan nozzles. All “air induction” nozzles have the same basic design feature-two orifices, one to meter liquid flow, and the other larger orifice to form the pattern. Between these two orifices is a venturi or jet, used to draw air into the nozzle body. In the body, air mixes with the liquid and forms an air-entrained spray pattern at a lower pressure. 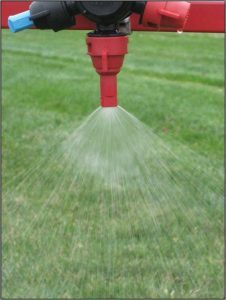 The coarse spray contains large, air-filled droplets and very few drift-susceptible droplets. 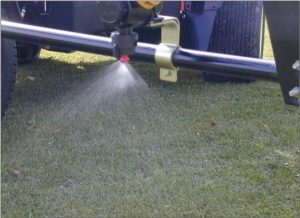 Venturi nozzles differ from conventional low-pressure spray nozzles by producing more coarse droplets and fewer fine droplets. Dramatic drift reductions have been observed with these tips while good spray coverage has generally been maintained. Some manufacturers suggest that the droplets are filled with air bubbles that cause the droplets to shatter on impact with the leaf, providing better coverage. Getting the maximum benefit from these nozzles, however, requires careful selection of the right nozzle for your needs and proper operation. You need to be aware of differences in pressure operating ranges, ease of cleaning, and the ability to fit into existing nozzle caps.